During the past two decades, new insights into the treatment of rheumatoid arthritis (RA) have led to improved clinical, functional and radiographic outcomes. The immediate introduction of disease modifying antirheumatic drugs (DMARD) after diagnosis resulted in better outcomes than delayed introduction.1–3 Numerous trials have confirmed the benefits of initial DMARD combination therapy, including glucocorticoids or tumour necrosis factor inhibitors, compared with initial DMARD monotherapy.4–10 In addition, several studies have shown that strict monitoring and control of disease activity leads to significantly improved outcomes compared with routine care.11–13 However, loss of tight control leads to reduced remission rates and increases in the Health Assessment Questionnaire (HAQ) and disease activity score (DAS).14 Implementation of these findings in new studies have resulted in an increasing percentage of patients with recent-onset RA actually achieving remission.8 12 Drug-free remission is rarely reported and to our knowledge, an attempt to achieve drug-free remission has never been part of a study protocol. From year 2 onwards, treatment strategies were continued, whereas treatment was still being adjusted to achieve a DAS of 2.4 or less. The protocol required patients on low-dose maintenance therapy who achieved a DAS less than 1.6 for at least 6 consecutive months to taper and discontinue all antirheumatic treatment. Here we report the follow-up results of clinical and radiographic outcomes, including the occurrence of drug-free remission and its predictors after 4 years of treatment in the BeSt study. 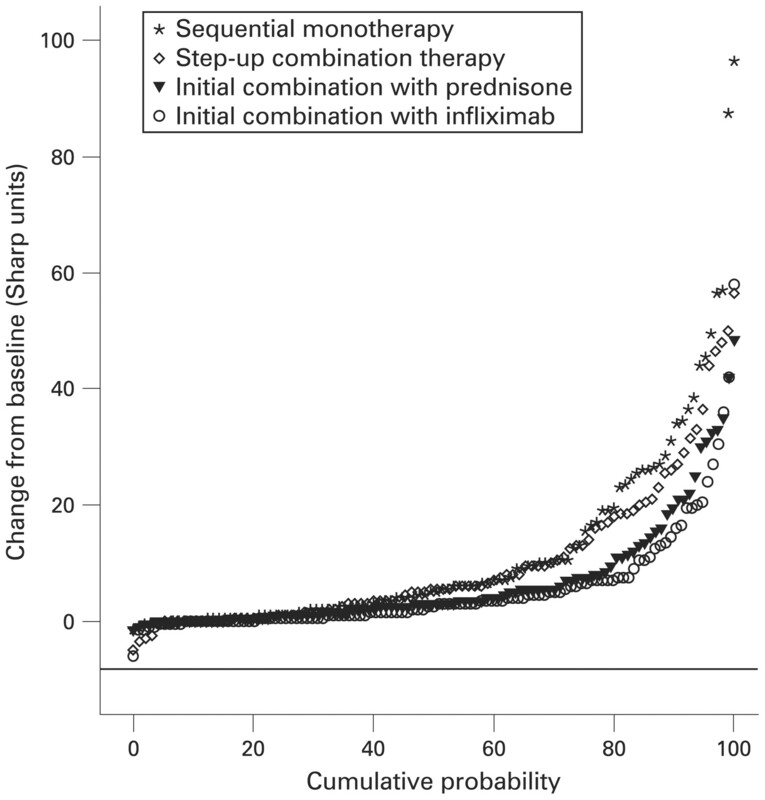 Patients were randomly allocated to one of four treatment groups: sequential monotherapy (group 1, n = 126); step-up combination therapy (group 2, n = 121); initial combination therapy including a tapered high dose of prednisone (group 3, n = 133) and initial combination therapy including infliximab (group 4, n = 128). For patients failing on their medication (defined as a DAS >2.4),16 the treatment protocol described a number of subsequent treatment steps. Briefly, patients in group 1 started with methotrexate, then sulphasalazine, then leflunomide, then methotrexate plus infliximab. Patients in group 2 also started with methotrexate, then methotrexate plus sulphasalazine, then methotrexate plus sulphasalazine and hydroxychloroquine, then methotrexate plus sulphasalazine and hydroxychloroquine and prednisone, then methotrexate plus infliximab. Patients in group 3 started with methotrexate plus sulphasalazine and prednisone (tapered from 60 to 7.5 mg/day), then methotrexate plus ciclosporin A and prednisone 7.5 mg/day, then methotrexate plus infliximab. Patients in group 4 started with methotrexate plus infliximab, then sulphasalazine, then leflunomide. The full treatment protocol including all steps is described elsewhere.15 If the DAS was 2.4 or less for at least 6 months, medication was gradually tapered until one drug (methotrexate in groups 1, 2 and 4, and sulphasalazine in group 3) was administered at a maintenance dose. In groups 3 and 4, prednisone and infliximab were always the first drugs to be tapered. In the extension phase beyond 2 years, patients who achieved a DAS of less than 1.6 for at least 6 consecutive months, while treated with monotherapy in a maintenance dose, tapered and discontinued all medication. If the DAS increased above 1.6, the last DMARD was immediately restarted, and if necessary (DAS >2.4) treatment was subsequently increased. The DAS was measured every 3 months by a trained research nurse who remained blinded to the treatment received. The primary clinical endpoints were functional ability, measured by the Dutch HAQ17 and the percentage of patients in drug-free remission, defined as a DAS of less than 1.6,18 without antirheumatic therapy. The primary radiographic endpoint was the change from baseline to 4 years in the total Sharp/van der Heijde score (SHS), ranging from 0 to 448.19 Radiographs of the hands, wrists and feet at baseline and after 4 years were scored independently by two trained readers masked to the patient’s identity, treatment group and sequence of the films. The mean score of the two readers was used for the analysis. The interobserver intraclass correlation coefficient was 0.96. Progression of joint damage was defined as a change in SHS greater than the smallest detectable change (SDC), which was 4.6 units.20 The radiographic progression data were also presented in a cumulative probability plot to visualise progression in individual patients.21 Radiographic progression in patients in drug-free remission was also assessed. Physical examination and laboratory tests were performed at each visit; all adverse events were recorded. If adverse events occurred, the treatment dose was reduced to the lowest tolerated dose. If a drug was not tolerated, the next step in the protocol was taken, or the other drug(s) of the combination were continued. Serious adverse events were defined as any adverse reaction resulting in any of the following outcomes: a life-threatening condition or death; a significant or permanent disability; hospitalisation; or a malignancy, regardless of the relation to the study treatment. Serious infections were defined as those leading to hospitalisation or death or requiring intravenous antibiotic treatment. Rates of serious infections that occurred during treatment with prednisone or infliximab were expressed as cumulative exposure adjusted event rates (number of events/100 patient-years of exposure to prednisone or infliximab). Before infliximab therapy, all patients were evaluated for tuberculosis with a purified protein derivative skin test and chest radiography. A sample size of 468 patients (117 per group) was needed to ascertain 80% power to detect a difference of at least 0.22 in the HAQ score after 2 years. The sample size also ensured greater than 80% power to detect a 20% or greater difference in the change score of radiological joint damage after 2 years. The initial cohort was followed longitudinally for 4 years. All available data were included and analyses were based on the intent-to-treat principle. We performed longitudinal data analysis of the HAQ with linear mixed-effects models with treatment strategy, time and their interaction as fixed effects and centre as random effect.22 For radiographic progression and the DAS, the main analysis was a completer analysis because 16% of radiographs and 22% of DAS measurements at 4 years were missing. For the DAS, a last observation carried forward (LOCF) analysis was performed as the secondary analysis. Multiple logistic regression analyses were performed to identify independent predictors of drug-free remission at 4 years. Independent variables were selected from univariate analyses if p<0.10. Variables with a Gaussian distribution were first analysed with a one-way analysis of variance (post-hoc least significant difference test); variables with a skewed distribution were tested with a Kruskal–Wallis test (post-hoc Mann–Whitney U test) and categorical variables were analysed by a χ2 test. At baseline, the four treatment groups were comparable with respect to demographic and disease characteristics.15 During the 4-year follow-up, a total of 54 patients (11%) across the four groups withdrew from the study (n = 11, n = 20, n = 14 and n = 9 in groups 1–4, respectively, overall p = 0.08; fig 1). Furthermore, an additional 70 patients (14%) across the four groups (n = 19, n = 15, n = 25 and n = 11 in groups 1–4, respectively, overall p = 0.11) had deviated from the treatment protocol. Study flow diagram. Reasons for withdrawal during the extension phase are included in the flow diagram. pat, patient; SAE, serious adverse event. Previously achieved improvements in HAQ score15 were maintained, resulting in 4-year improvements from baseline of −0.8, −0.7, −0.8 and −0.8 (overall, p = 0.64) in groups 1–4, respectively (mean overall improvement of −0.8, table 1). In the mixed model analysis it was found that there was a significant difference in improvement of the HAQ with time between the four groups: the differences between groups 1 and 2 versus groups 3 and 4 were highly significant (p<0.001), the difference between groups 3 and 4 was also significant (p = 0.04) and the difference between groups 1 and 2 was not significant (p = 0.18). Radiographs of the hands, wrists and feet at baseline and after a 4-year follow-up were available for 425 patients (106 (84%) in group 1, 96 (79%) in group 2, 108 (81%) in group 3 and 115 (90%) in group 4). After 4 years, the median total SHS progression was 5.0, 5.5, 3.0 and 2.5 Sharp units in groups 1–4, respectively (p<0.05 for group 4 versus groups 1 and 2, table 1). Joint damage progression greater than SDC was observed in 51%, 54%, 38% and 31% of patients in groups 1–4 (p<0.05 for group 4 versus groups 1 and 2 and for group 3 versus group 2, fig 2). Cumulative probability distribution of total Sharp/van der Heijde Score over 4 years of treatment with sequential monotherapy, step-up combination therapy, initial combination therapy including prednisone or initial combination therapy including infliximab. The smallest detectable change was 4.6 Sharp units and is represented by the horizontal line. After 4 years of continued DAS-driven treatment, 43% of patients were in clinical remission (DAS <1.6), regardless of whether they were on or off drugs (50%, 41%, 38% and 42% in groups 1–4, overall, p = 0.40). LOCF analysis did not change these results (data not shown). Between months 24 and 48, drug-free remission was achieved by 20% of all patients (21%, 17%, 16% and 27% of patients in groups 1–4, respectively, overall, p = 0.10) and was maintained for a mean (SD) duration of 9 months (6.4). At 4 years, 13% of all patients were still in drug-free remission (14%, 12%, 8% and 18% of patients in groups 1–4, respectively, overall, p = 0.14), whereas 36 patients (8, 6, 10 and 12 in groups 1–4, respectively) restarted methotrexate or (in group 3) sulphasalazine due to a DAS of 1.6 or greater after on average 5 months. The mean duration of drug-free remission in the 67 patients still in drug-free remission at 4 years was 11 months (6.3) and 57 of these 67 patients (85%) achieved drug-free remission after a continued good response on the initial treatment. Sixty-three of the 67 patients in drug-free remission had HAQ scores of 0.50 or less, which is similar to values of a normal population.23 Joint damage progression greater than SDC from baseline to 4 years was seen in 33%, 14%, 20% and 10% of patients in drug-free remission in groups 1–4 (overall, p = 0.28). Compared with the patients not in drug-free remission, patients who achieved drug-free remission had characteristics of milder RA at baseline (table 2). After multivariate regression, the absence of anti-cyclic citrullinated peptide (CCP) antibodies (p = 0.004), male gender (p = 0.02) and short symptom duration (p = 0.03) were independently associated with drug-free remission at 4 years. Treatment strategy was not independently associated with drug-free remission. The treatment goal of a DAS of 2.4 or less was achieved by 81% of patients at 4 years, without significant differences between the groups (p = 0.10). LOCF analysis did not change these results. 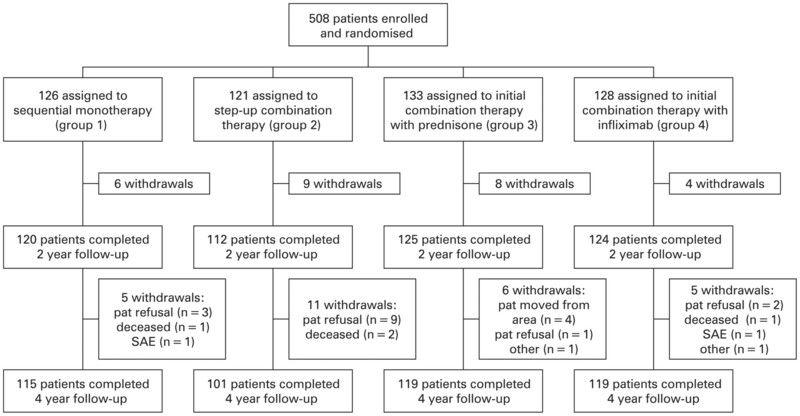 Of all included patients, after 4 years, 24%, 29%, 29% and 16% of patients in groups 1–4 were either lost to follow-up, or had stopped following the treatment protocol. Twenty-seven per cent, 23%, 48% and 67% of the patients in groups 1–4, respectively, achieved a DAS of 2.4 or less on the initial treatment (methotrexate monotherapy in groups 1 and 2, methotrexate, sulphasalazine and initially high-dose prednisone in group 3 and methotrexate and infliximab in group 4) at year 4. In groups 3 and 4, the majority of these patients (31% of patients in group 3 and 48% of patients in group 4) had been able to taper their medication to DMARD monotherapy or no DMARD at all (fig 3). On the other hand, at 4 years, 49%, 48%, 23% and 17% of the patients in groups 1–4 had not reached or had lost the goal of a DAS of 2.4 or less on the initial treatment and had moved on to subsequent treatment steps in their respective strategy arm (fig 3). Percentage of patients on different treatment steps, including the occurrence of drug-free remission (no disease-modifying antirheumatic drugs; DMARD) in four different treatment strategies during 4 years of follow-up. AZA, azathioprine; CSA, ciclosporin A; IFX, infliximab; LEF, leflunomide; MTX, methotrexate; no DMARD, drug-free remission; other, in groups 1–3 patients in treatment steps beyond MTX + IFX, and in group 4 patients treated with SSA, LEF, CSA, gold or AZA, combined with patients who were treated outside the treatment protocol in all groups; pred, prednisone; SSA, sulphasalazine; step-up combi, patients treated with MTX + SSA (+ hydroxychloroquine + prednisone). See treatment protocol15 for detailed information on the sequence of treatment steps in the different groups. During 4 years of treatment, 39% of patients in group 1, 11% in group 2 and 20% in group 3 started with a combination of methotrexate plus infliximab, and at the end of year 4, 19%, 6% and 12% of patients in groups 1–3 were still treated with methotrexate and infliximab, compared with 20% of patients in group 4 who were still treated with methotrexate plus infliximab. During 4 years, 6%, 22%, 99% and 16% of patients in groups 1–4 ever received prednisone therapy. The mean cumulative prednisone doses administered during 4 years were 177 mg prednisone in group 1, 565 mg in group 2, 4116 mg in group 3 (of which 1899 mg was administered during the initial 28-week period of initial high tapered to low-dose prednisone) and 588 mg in group 4. Overall, 82% of patients experienced at least one adverse event and 25% of patients experienced at least one serious adverse event (table 3).24 The majority of the adverse events were mild to moderate and did not result in treatment discontinuation or dose reduction. Significantly, more serious infections occurred in group 1 compared with group 2. Under the limitation that knowledge of treatment currently or recently received may influence the interpretation of an infection as “serious”, we have looked at the rate of infections and serious infections in relation to treatment with infliximab and prednisone. We found that of the 25 serious infections in all groups, 11 episodes occurred during treatment with infliximab and five during treatment with prednisone. Total exposure to infliximab was 329.1 patient-years (86.5, 22.1, 39.3 and 181.1 in groups 1–4, respectively), resulting in a cumulative rate of serious infections for years 0–4 of 3.3 events/100 patient-years on infliximab treatment. Total exposure to prednisone was 240.3 patient-years (9.2, 27.8, 174.8 and 28.5 in groups 1–4, respectively), resulting in a cumulative rate of serious infections for years 0–4 of 2.1 events/100 patient-years on prednisone treatment. During 4 years, six cases of non-melanoma skin cancers were reported; five of these cases developed in patients who had been treated with infliximab. None of the other malignancies developed during or after treatment with infliximab. No cases of tuberculosis were observed during the third and fourth years. In total, eight deaths occurred during the 4-year follow-up (table 3). The 4-year follow-up data of the BeSt study show that continued tight disease control in patients with recent-onset RA resulted in sustained functional and clinical improvement, regardless of the treatment strategy. Radiological damage progression over time is still significantly lower in patients treated with initial combination therapy including either prednisone or infliximab (groups 3 and 4) than in patients treated with initial monotherapy, although the differences were small. The clinical relevance of these differences will need to be clarified with longer follow-up, because joint damage is assumed to have the most impact on disability with longer disease duration.25 26 Compared with group 1, relatively few patients in group 2 proceeded to treatment with methotrexate plus infliximab. Differences in treatments prescribed after methotrexate failure,27 including prednisone in group 2 and the continuous step-up and step-down approaches in group 2 may have influenced this observation. For the first time in a large trial in RA patients, the treatment protocol of the BeSt study provided instructions for the introduction of drug-free remission. From the third year of the study, patients who achieved remission (DAS <1.6) for at least 6 consecutive months, tapered and stopped the last DMARD, being methotrexate or in some cases sulphasalazine. Drug-free remission was achieved and maintained in 8–18% of patients and has lasted until now for an average period of one year, without significant differences between the four strategies. The absence of anti-CCP antibodies, male gender and short symptom duration were independently associated with drug-free remission. Although in general patients in drug-free remission appeared to have milder disease characteristics, at baseline 69% already had erosive disease, 52% were rheumatoid factor positive, 43% were anti-CCP positive, the mean HAQ was 1.2 and the mean DAS was 4.1. Previous studies on remission reported varying percentages of remission, due to differences in patient enrollment, study population, definitions of remission and treatment.12 28–30 Drug-free remission in recent-onset RA, however, is seldom reported as an endpoint of treatment. In a prospective study involving 135 early RA patients, 32 (5%) of 606 “DMARD courses” were discontinued because of remission, compared with 528 courses that were terminated for other reasons.31 Similar low percentages of drug-free remission were also reported in other studies.32 33 Several studies reported a high incidence of disease flares as soon as treatment was withdrawn.34–36 In the BeSt study, the prevalence of drug-free remission remained remarkably high (12–14% with initial methotrexate monotherapy, 8% with initial combination therapy including a tapered high dose of prednisone and 18% with initial combination therapy including infliximab), taking into account that in on average 35% of patients who achieved drug-free remission, treatment was reinitiated because the DAS increased to 1.6 or greater. 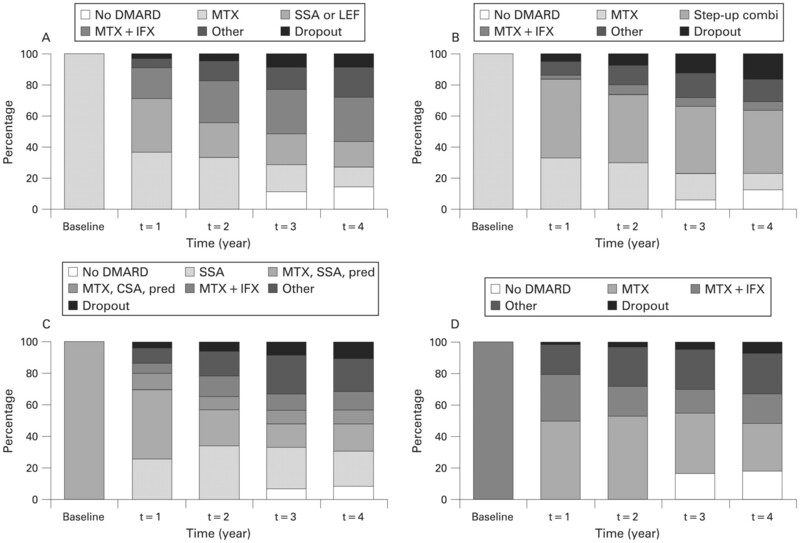 Other studies in early RA indicate that low disease activity or even remission can be maintained after the discontinuation of infliximab, but with the continuation of low-dose methotrexate.37–39 This analysis provides further evidence that preservation of low disease activity for as long as 35 months after infliximab discontinuation is possible after a relatively short course (mean 9 months) of infliximab induction therapy. Previous research has shown that in 7–17% of patients with RA in clinical remission progression of joint damage still occurs.40 41 We found that 10–33% of patients in drug-free remission also showed joint damage progression from baseline to 4 years. As yet, we have no information as to whether damage progression continued once drug-free remission was achieved, because we could not read radiographs from all four timepoints. In the prolonged follow-up of the BeSt study, blinded radiographs from all timepoints will be read in the same session. This will help us to determine any changes in the slope of radiographic progression in the four groups, and will reveal whether clinically significant damage occurs without clinically noticeable inflammation. The percentages of patients experiencing adverse events or serious adverse events were not significantly different between the four groups. Due to the dynamic treatment design of the study, it is possible that some adverse events that occurred during a specific treatment are actually related to the previous therapy. The impression that some patients developed serious infections while they were treated with infliximab or prednisone could be partly due to expectation bias influencing the reports. These concerns make it awkward to draw firm conclusions on the toxicity of the different treatments used, but at least between the strategies there appears to be no significant difference in toxicity. All infections responded well to antibiotic treatment. No malignancies developed during infliximab treatment, except for five relatively indolent non-melanoma skin cancers. In conclusion, tight control using DAS-driven therapy adjustments leads to prolonged reduction of disease activity and improvement in functional capacity, irrespective of treatment strategy. Radiological damage progression remains lower in patients treated with initial combination therapy including prednisone or infliximab. These results confirm the importance of early effective treatment and continued tight control and demonstrate that once a continuous good clinical response is achieved, the discontinuation of combination therapy and even drug-free remission are realistic possibilities in the treatment of patients with recent-onset active RA. The authors would like to thank all patients as well as the following rheumatologists (other than the authors) who participated in the Foundation for Applied Rheumatology Research (all locations are in The Netherlands): C Bijkerk, MD (Reinier de Graaf Gasthuis, Delft); MHW de Bois, MD and G Collée, MD (Medical Center Haaglanden, The Hague); JAPM Ewals, MD (Haga Hospital, The Hague); AH Gerards, MD (Vlietland Hospital, Schiedam); JHLM van Groenendael, MD (Franciscus Hospital, Roosendaal); KH Han, MD (Medical Center Rijnmond-Zuid, Rotterdam); JMW Hazes, MD (Erasmus Medical Center, Rotterdam); HMJ Hulsmans, MD (Haga Hospital, The Hague); MH de Jager, MD (Albert Schweitzer Hospital, Dordrecht); JM de Jonge-Bok, MD (retired); MV van Krugten, MD (Walcheren Hospital, Vlissingen); H van der Leeden, MD (retired); WF Lems, MD (Slotervaart Hospital, Amsterdam); MF van Lieshout-Zuidema, MD (Spaarne Hospital, Hoofddorp); A Linssen, MD (retired); C Mallée, MD (Kennemer Gasthuis, Haarlem); ETH Molenaar, MD (Groene Hart Hospital, Gouda); HC van Paassen, MD (Sint Franciscus Gasthuis, Rotterdam); AJ Peeters, MD (Reinier de Graaf Gasthuis, Delft); HK Markusse, MD (deceased); D van Schaardenburg, MD (VU Medical Center, Amsterdam and Jan van Breemen Institute, Amsterdam); PEH Seys, MD (Lievensberg Hospital, Bergen op Zoom); RM van Soesbergen, MD (retired); PBJ de Sonnaville, MD (Oosterschelde Hospital, Goes); I Speyer, MD (Bronovo Hospital, The Hague); KSS Steen, MD (Kennemer Gasthuis, Haarlem); JPh Terwiel, MD (Spaarne Hospital, Hoofddorp); AE Voskuyl, MD (VU Medical Center, Amsterdam); ML Westedt, MD (Bronovo Hospital, The Hague); S ten Wolde, MD (Kennemer Gasthuis, Haarlem); JMGW Wouters, MD (Sint Franciscus Gasthuis, Rotterdam); D van Zeben, MD (Sint Franciscus Gasthuis, Rotterdam). The authors would also like to thank all other rheumatologists and trainee rheumatologists who enrolled patients in this study and all research nurses for their contributions.
. Randomised comparison of combined step-down prednisolone, methotrexate and sulphasalazine with sulphasalazine alone in early rheumatoid arthritis. Lancet 1997;350:309–18.
. Treatment of rheumatoid arthritis with methotrexate alone, sulfasalazine and hydroxychloroquine, or a combination of all three medications. N Engl J Med 1996;334:1287–91.
. Effectiveness of systematic monitoring of rheumatoid arthritis disease activity in daily practice: a multicentre, cluster randomised controlled trial. Ann Rheum Dis 2005;64:1294–8.
. 5 year follow-up of the trial of tight control for rheumatoid arthritis (TICORA) study [abstract]. Arthritis Rheum 2006;54(Suppl 9):S310.
. Measurement of disability in Dutch rheumatoid arthritis patients. Clin Rheumatol 1984;3:305–9.
. How to read radiographs according to the Sharp/van der Heijde method. J Rheumatol 2000;27:261–3.
. Deciding on progression of joint damage in paired films of individual patients: smallest detectable difference or change. Ann Rheum Dis 2005;64:179–82.
. Radiographic progression depicted by probability plots: presenting data with optimal use of individual values. Arthritis Rheum 2004;50:699–706.
. Validity of area-under-the-curve analysis to summarize effect in rheumatoid arthritis clinical trials. J Rheumatol 1999;26:712–16.
. Normative values for the Health Assessment Questionnaire disability index: benchmarking disability in the general population. Arthritis Rheum 2004;50:953–60.
. Disseminated tuberculosis, pulmonary aspergillosis and cutaneous herpes simplex infection in a patient with infliximab and methotrexate. Intensive Care Med 2003;29:2327–9.
. The links between joint damage and disability in rheumatoid arthritis. Rheumatology (Oxford) 2000;39:122–32.
. Limited efficacy of conventional DMARDs after initial methotrexate failure in patients with recent onset rheumatoid arthritis treated according to the disease activity score. Ann Rheum Dis 2007;66:1356–62.
. Early rheumatoid arthritis—onset, course, and outcome over 2 years. Rheumatol Int 1990;10:135–42.
. Ten year outcome in a cohort of patients with early rheumatoid arthritis: health status, disease process, and damage. Ann Rheum Dis 2002;61:1055–9.
. Remission in rheumatoid arthritis. J Rheumatol 1985;12:245–52.
. Utility of disease modifying antirheumatic drugs in “sawtooth” strategy. A prospective study of early rheumatoid arthritis patients up to 15 years. Ann Rheum Dis 1999;58:618–22.
. Use of second line drugs for the treatment of rheumatoid arthritis in Edmonton, Alberta. Patterns of prescription and longterm effectiveness. J Rheumatol 1995;22:836–43.
. Long-term second-line treatment: a prospective drug survival study. Br J Rheumatol 1992;31:253–8.
. d-Penicillamine withdrawal in rheumatoid arthritis. Ann Rheum Dis 1984;43:213–17.
. Severe flare of rheumatoid arthritis after discontinuation of long-term methotrexate therapy. Double-blind study. Am J Med 1987;82:781–6.
. Persistence of clinical benefit in rheumatoid arthritis after discontinuation of TNF-inhibitor therapy: analysis from the CORRONA database [abstract]. Arthritis Rheum 2007;56(Suppl 9):S311.
. Infliximab and methotrexate as induction therapy in patients with early rheumatoid arthritis. Arthritis Rheum 2007;56:2129–34.
. Radiological damage in patients with rheumatoid arthritis on sustained remission. Ann Rheum Dis 2007;66:358–63.